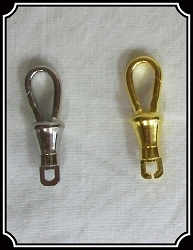 Immpressive enough to not need a Fob, the chain is done in a heavy double link with gold finish. Folks will stop to take notice. 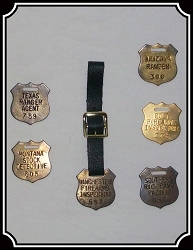 This is just the thing for the discerning banker or business owner. 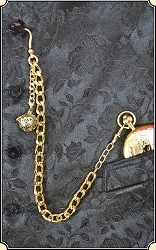 With double chains for keeping a watch and the key to the safe. 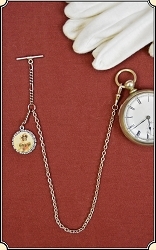 Wrap your sweetheart in elegance with a picture frame and keep your pocket watch always with you. 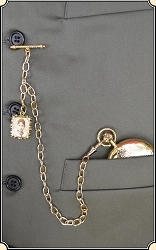 Always keep a picture of your sweetheart close and your pocket watch closer. 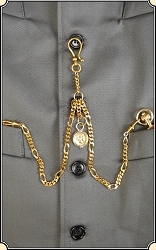 With a small picture frame and silmple chain, this is a must have for the Cowboy on the trail. 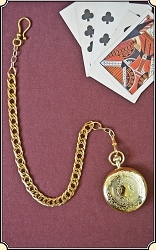 Add extra class to your fancy duds with this Double Watch chain, comes in Silver or Gold color ~ Fob not included. 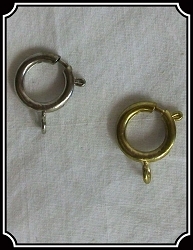 Spring rings for watch chain Nickel or Yellow Gold Plated. 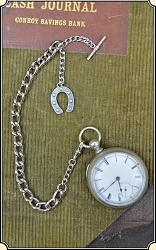 Save your favorite necklace or chain by converting it into an eye catching watch chain with one of these practical devices ~ Silver or Gold color. 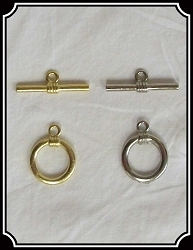 Convert your favorite necklace or chain into an eye catching watch chain with one of these practical devices Silver or Gold color. 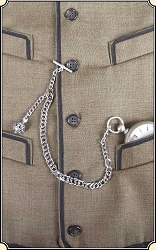 And what would your fine watch be without a fancy fob? 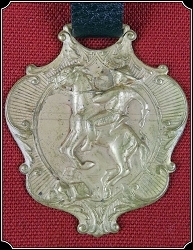 A Cowboy astride his hores surrounded by fancy scroll work.